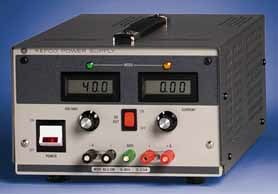 Kepco's MSK linear power supplies provide a selection of five models, offering 100 Watts of stable benchtop power. They use a high gain linear (series pass) stabilizer circuit for ultra low noise and low ripple output, good stability, and accurate resettability. MSK's "Preview" switch (d-c on-off) allows voltage and current to be pre-set with the digital meters displaying the set values. At "d-c off," no voltage is applied to the output terminals and no load current needs to be drawn to set the current limit. At "d-c on," the set voltage is applied to the output terminals, the appropriate mode indicator illuminates and the meters indicate actual voltage and current. Convenient heavy duty front panel binding posts, that accept wires or mating "banana "plugs, allow easy connection to your breadboards. A built-in, quiet, low-speed fan ensures good cooling in any environment.